There are tons of aquarium lighting options out there, from bulbs, fixtures and hoods to light strips and tubes. The right lighting is an essential aspect not only to the aesthetics of the tank, but to the health and happiness of the fish as well. This basic aquarium lighting guide will give you some useful and unique ideas to help get you started on choosing the right lights. Incandescent light fixtures have the cheapest initial cost, but you should avoid them for several reasons. They burn out faster than other types, so you will need to replace them more often. They use more electricity than other types and will unnecessarily drive up your power bill. Finally, they produce a lot of heat which interferes with the tank’s water temperature regulation. If you purchase a smaller starter aquarium kit it will likely come with an incandescent fixture. 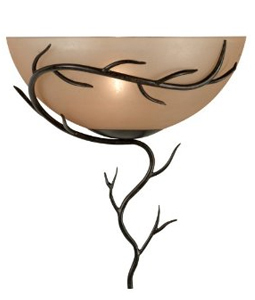 You can easily replace this fixture with a more efficient one that will cost you less in the long run. Fluorescent fixtures are most commonly used for aquarium light settings. The fixtures and the bulbs are more expensive than incandescent ones, but you will not have to replace them as often and they cost less to run. Standard fluorescent lighting will get the job done for most any aquarium, but there are other types that are better suited for certain environments. Very high output (V.H.O.) fluorescent lights are great for large/tall tanks, reef aquarium lighting, or those with densely packed plant life. They produce as much as three times the amount of light as a standard fluorescent bulb. Power compact fluorescent lights are another option for plant and reef fanatics. They give off a little more light than V.H.O.s and some can fit into regular incandescent fixtures, just be careful not to exceed the fixture’s max wattage allowance. Using LED lighting to simulate moonlight is a captivating way to illuminate a tank at night without disrupting the routine of the fish. When done properly it can even stimulate more healthy growth and activity during the night time hours. Blue LED lighting with a spectrum of 470 nm to 480 nm is optimal for moonlight simulation. They create a soft blue glow that makes the tank look fantastic and you should see an improvement in vegetation growth with no difference in the energy level of the fish. Try having them come on about an hour before your day time lighting goes off and shut off around three or four in the morning. Fish alone do not need a particularly well-lit tank. In fact, most generally prefer just enough light to be able to tell the difference between day time and night time (and for you, enough to be able to adequately see the fish). Putting the lighting on a timer is the easiest way to provide them with the recommended 10 to 12 hours of light each day. Tanks with live anemones, corals, and/or plants crave more intense lighting and should receive around 12 to 14 hours of light per day. Outdoor living areas are quite popular today as families use their decks and patios to extend their living space into the backyard for entertaining, grilling or just more family fun. The deck area of today’s house becomes an extension of the interior decor of the home as deck use becomes more important to everyday family life. Whether you are building a new deck or planning on improving an existing one, you will want to pay special attention to a carefully thought out plan for deck lighting to enhance your deck. Lighting not only illuminates the deck space to provide safe and well-lit use after dark, ward off intruders, but also serves as a way to carry the interior decor of the inside of your home through to your outdoor living space, making them flow together seamlessly. Outdoor lighting fixtures are available in a wide array of choices and designs that are appropriate for any budget, installation and needed ambiance. Basic deck lighting ideas include post mounted lights, post cap lights, wall sconces, recessed floor lights, stair tread lighting, outdoor lanterns, and umbrella lights. These fixtures may be hardwired by an electrician on house current with regular wattage use, be installed as LED deck lighting designs, or save money and electricity with solar deck lighting choices. 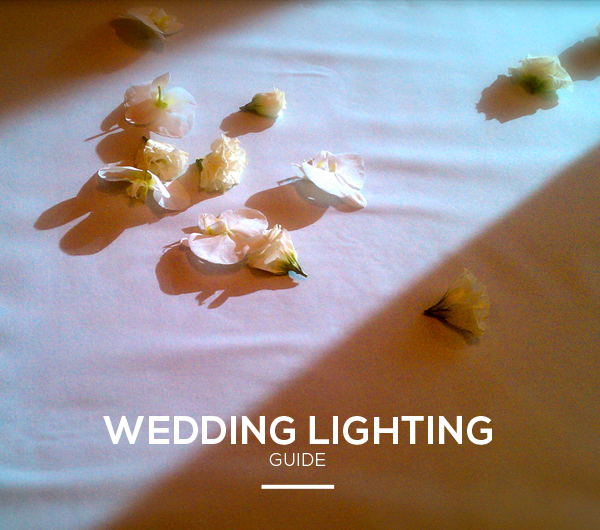 It is easy to mix combinations of these different lighting sources to create the perfect solution for your needs. If your deck is currently or will soon be under construction, now is the time to plan and install any fixtures that need to be hardwired by an electrician. Wires can be run up through deck posts now for post cap lights and post lights mounted higher up the sides of the post. Wall scones also can be installed now. The construction period is also a great time to install LED lighting so the low voltage transformers on which they operate can be placed out of sight. LED lighting can be added to an existing deck also where you find a way to place the transformer in a safe location. Adding decorative outdoor lighting can be a simple task with the right light fixtures. When improving an existing deck, solar lights are your best option as they do not require any wiring. 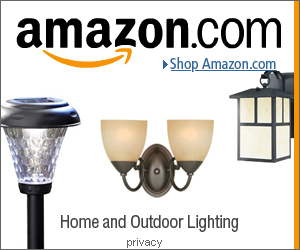 These sensible light fixtures come as post caps, wall and post mounted sconces that compliment or match the post caps, and there are even solar mosquito killer light options. 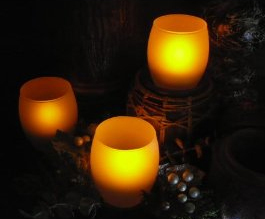 They enhance your deck with a soft, inviting glow. Solar LED table top light fixtures in many decorative designs are also available for that more romantic touch. 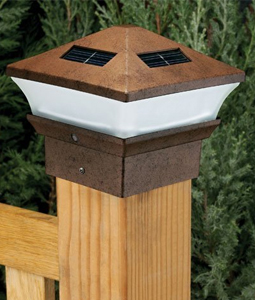 Water proof wall mounted outdoor solar landscaping fixtures are also available that use ultra bright LED bulbs. 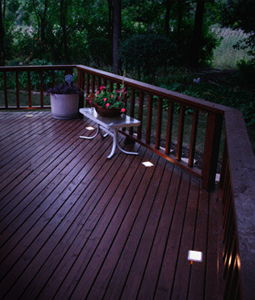 LED lights are another excellent choice for lighting your deck. Recessed LED solar deck lights can be added in the floor of the deck to illuminate where you step without blinding you as you walk over them. These up-lighters are one of the most widely used deck fixtures and their kits come with twenty to a set, making them an economical choice. LEDs last much longer, use significantly less energy, will not burn a bare foot, and come in solar or low wattage options. 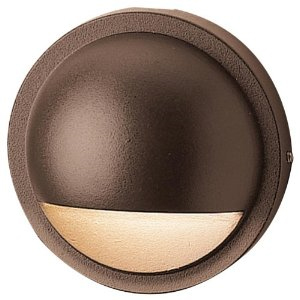 They are also perfect for recessed lighting on stairs. Deck lighting kits for floor and step options are available for do-it-yourselfers, as well as other designer kit choices. Finish off your deck with decorative outdoor string lights or “fairy lights” around the rail or a solar umbrella light to illuminate without attracting bugs to the table. Whether you design your lighting for safety, security, a more intimate atmosphere or a combination of any or all of these, a lighting scheme that is well planned and implemented will be an asset to the value and enjoyment of your deck and your home.